Cristiano Ronaldo: Can Juventus star restore Serie A to its former glory? Serie A boasts three of Europe's best attacking players in Milan's Gonzalo Higuain, Juve's Cristiano Ronaldo and Inter's Ivan PerisicSerie A can never be reduced to a one-man show and it simply cannot be all about Cristiano Ronaldo. Nevertheless, it is hard to understate the impact his arrival at Juventus has had on the league before a ball has even been kicked. The 33-year-old five-time Ballon d'Or winner is not only one of the two best players of the last decade, he is also one of the most popular people on the planet. Ronaldo has 313m followers across all social media platforms and it feels like he has turned their attention to Serie A. "Finally the world is talking about the Italian league again," Fabio Capello marvelled in La Gazzetta dello Sport. "In the 80s and 90s we represented the top. Then we lost our way and weren't capable of investing in infrastructure. "With Ronaldo we can attempt to lift our head up. But it's not enough on its own. We need to have the strength and intelligence to exploit the Ronaldo stimulus and give our game an impulse again." 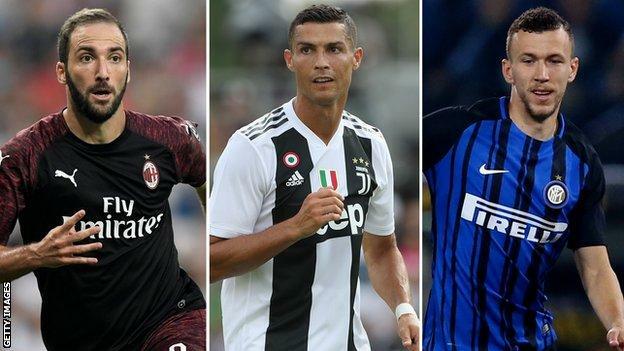 The consensus in the media viewed the £99.2m deal, which will earn Ronaldo £27.7m a year, as the most significant step yet in restoring Serie A to its former glory. "The peak was in 2003 when we had two teams in the Champions League final," recalled Claudio Ranieri, a former Juve manager, in La Stampa. "We're not back to those days yet. But I feel like saying the days of skinny cows are over. "Ronaldo is fattening them up. The rights are now probably worth 20 to 30% more, which means the Ronaldo tide will not lift all boats. The uplift in revenue is forecast to take Juventus to the next level in the rich list, such are Ronaldo's commercial powers of attraction. But what does it say about Serie A? While Gazzetta think Agnelli and the Juventus board deserve the Nobel Prize for Economics, La Repubblica compared the Ronaldo transfer to the plot of Christopher Nolan's Interstellar. In light of Agnelli's pro-European Super League stance, is this not the clearest sign yet that Juventus want to leave the crop plights and dust storms of Serie A behind for a new planet, where one day all of the continent's elite teams will play against each other week in, week out?And what about competitive balance? Il Corriere dello Sport reacted to the news with an Atticus Finch line from Harper Lee's classic To Kill a Mockingbird. "It's when you know you're licked before you begin, but you begin anyway and see it through no matter what." Can anyone challenge Juve for the title? But the same comments were made when Juventus paid the buy-out clauses to take Gonzalo Higuain from Napoli and Miralem Pjanic from Roma two seasons ago. And that didn't stop Serie A from being the most compelling league in Europe last term, when Napoli pushed Juve to the penultimate game and you didn't know who had qualified for Europe or who'd be staying up and going down until the final day. Inter look like the team most likely to challenge Juventus this season. Emboldened by guaranteed Champions League money, the signings of Stefan de Vrij, Radja Nainggolan, Sime Vrsaljko and Keita Balde Diao improve the starting XI, while Lautaro Martinez has the look of the league's next big thing. As for AC Milan, who would have thought defaulting on their debt and being repossessed this summer would turn out to be such a positive. The club's new owners, Elliott Management, are credible - the hedge fund have $34bn worth of assets - and the appointment of Leonardo as sporting director has delivered instant results in recruitment. Aware of how much Juventus needed to sell after the Ronaldo signing and how much Leonardo Bonucci wanted to go back to Turin, the former Brazil midfielder was able to use that as leverage to sign Serie A's most prolific goalscorer of the last five years, Gonzalo Higuain, and the league's best defensive prospect, Mattia Caldara. Going into the summer Milan were expected to be weaker. Instead they come out of the transfer window looking a lot stronger.